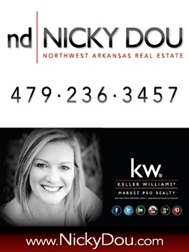 Townhome for sale in Bella Vista, AR - Golf Course Views! Check out this beautiful 1950+ ht.sq.ft. townhouse in Bella Vista, Arkansas. Home has 3 bedrooms, 2 full baths, 2 living areas - each with its own fireplace! Lots of windows with views of Kingswood Golf Course. A cart path to the course right out your front door, too! 12 Melissa Lane is a great value at only $114,900 & Seller will pay $5000 of your closing costs - OR you can have it to update home as you wish. All appliances convey including washer/dryer/fridge... as well as central vac! Need space for vehicles? This townhouse comes with its very own 2-car garage/carport with extra storage room as well! HURRY! Located in the Bentonville School District!